A reader (AKA indie reader or social reader) in the context of the indieweb is the portion/feature integrated into an indieweb site that provides a way to read content from other indieweb sites, possibly including posts from the current site, and respond (like, comment, repost, etc) inline in the reading UI itself. The latest exciting development in readers is easy to set-up interactive Social Readers built on top of the emerging Microsub standard that builds on the openness of yesterday’s feed readers, modernized with interactivity everyone now expects from social media. 🆕 Sign-into Aperture (https://aperture.p3k.io/) and try one of these social readers! Preview all posts in a channel, with the option to send a reply via Micropub or view the original post at the permalink. 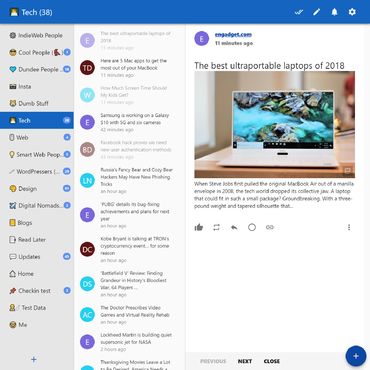 Monocle is a reader that is a generic Microsub client and can be used with any Microsub server, written by Aaron Parecki. Preview and subscribe to websites, arranging them into "channels." Create interactions including Like, Repost, and Reply, publishing those interactions to your website via Micropub. 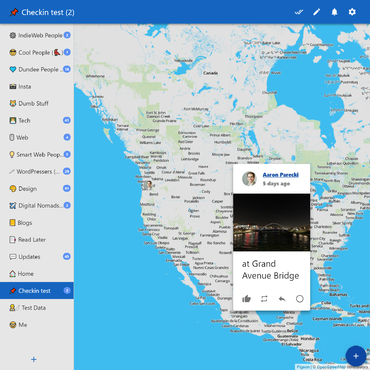 Different layouts to view posts as a timeline, gallery, map or classic 2 pane reader. backfeeding replies/favorites/retweets onto your original notes (e.g. using Bridgy). 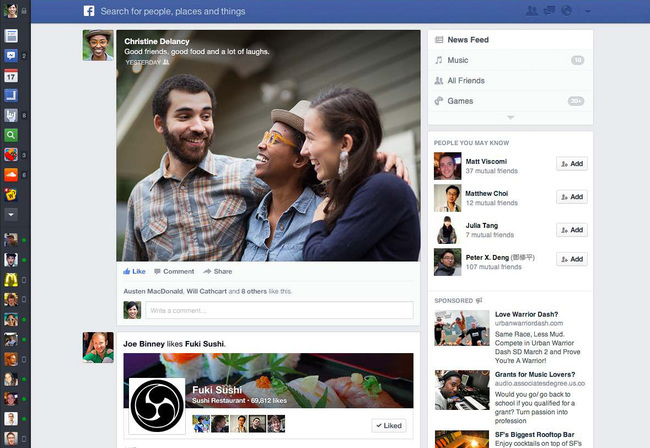 Filter and prioritize posts from others using algorithms of your own choosing. That's just the beginnings of what an indieweb reader can enable. In datetime order of implementation (earliest first). Note: 2018-11-19 some of these may be out of date, need to review them to see which are still active and move others to a former examples subsection. Ashton McAllan developed a Wordpress plugin, WhisperFollow, which aggregates RSS/Atom and Microformats2 data from the pages linked to in your blogroll and displays those updates in a private page in your wordpress blog. It currently defaults to RSS/Atom only attempting to read MF2 if the separate feed isn't found. It also allows updates to be reblogged, replied to, favourited, and commented on etc. Barnaby Walters developed Intertubes, an experimental indieweb-oriented flow-based programming + feed reader UI parsing microformats and shimmed twitter.com microformats. sandbox for experimenting — try making your own feeds! Amber Case also uses selfoss with the Microformats2 plugin on caseorganic.com since 2014-02-13. Andy Sylvester also uses selfoss with the Microformats2 plugin on http://andysylvester.com/selfoss/ since 2014-03-01. See http://andysylvester.com/2014/03/01/howto-setting-up-the-selfoss-feed-reader-with-microformats-support/ for instructions on how to set up the Selfoss reader. At IndieWebCamp 2014, Ben, Aaron, and Emma built an IndieReader demo/prototype in PHP reusing components from their personal site implementations. Emma Kuo used an experimental reader in neonblog since 2014-7-26.
thready, a thread reader created for Indieweb Summit 2016 hack day. Sign up/login via indieauth, open to anyone. Supports h-feed via mf2util and XML feeds via Python's excellent feedparser. Support different strategies for posting responses -- micropub, indie-config, and custom URL endpoints. Sign up/login open to anyone via traditional username/password with email confirmation. Login is also publicly available via IndieAuth, and posts created via Micropub in this case. When IndieAuth is used but Micropub is not available, indie-config is used for actions. Supports displaying previous actions made by using the indie-config status protocol. 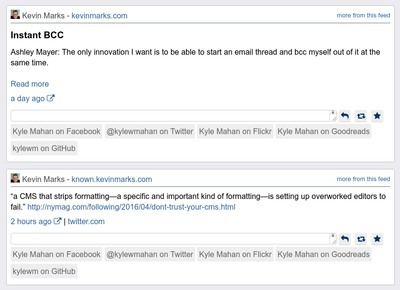 Supports multi-feed discovery via link tags or rel=feed. Supports subscribing to any page containing h-feeds or h-entry's (as well as xml feeds). Supports in-line posting, likes, shares and replies. Update notifications from both PubSubHubbub and rssCloud. Imports a list of feeds (OPML) from many other readers including: Google Reader, Feedly, Newsblur, inoreader. Easily reposting stories (including the full contents, photos, etc) or posting them as read, bookmark, like, favorite, etc. posts (one could also mark them as read privately). A bookmarklet for easily adding individual stories and or saving sources for subscribing to at a later date. An integrated clean reading interface courtesy of Mercury (fka Readability). The ability to save a full archival copy of the posts within the reader. Yarns is a reader that is built for use with WordPress as a plugin. It supports microformats and micropub. Built by Jack Jamieson and announced on his site on 2018-02-08. It's based in part on Ashton McAllan's WhisperFollow with inspiration by Woodwind. Development and distribution of the project is done on Github. Aaron Parecki developed a Microformats2 plugin for selfoss, and ran it on a subdomain of aaronparecki.com around 2014-02-13. The reader polls the subscriptions at a predefined interval looking for new h-entry posts on each person's home page. 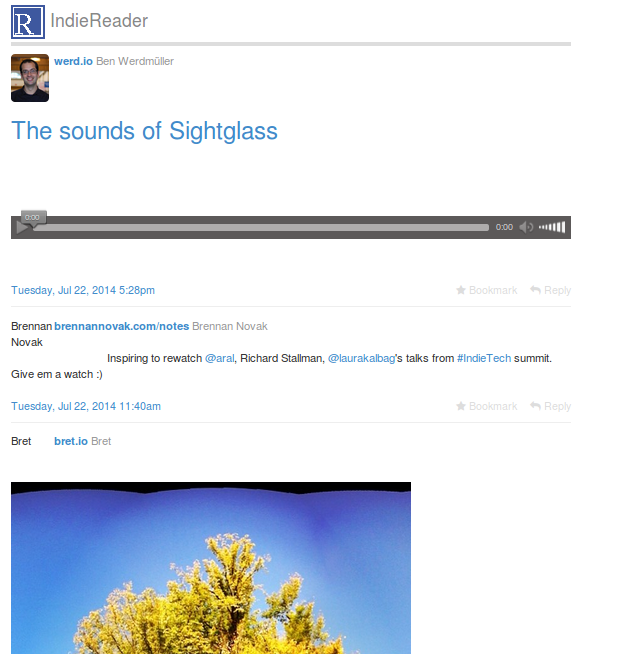 Woodwind is an open source social reader that supports subscribing to h-feed and XML feeds, as well as IndieAuth and Micropub. 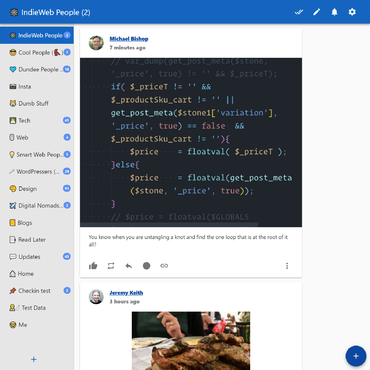 A single integrated news feed of friends' activities, including posts and likes. 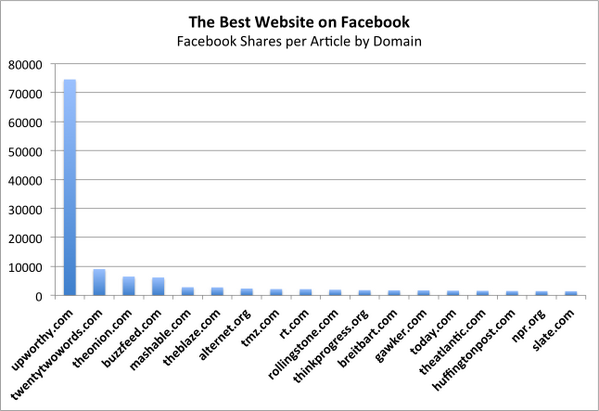 ...users who were switched to the new News Feed tended to spend less time on the site. Fewer UI elements overall (including fewer navigation links, especially with activity numbers on those other pages). All of these differences provided for a better-for-the-user user experience (faster, more focused, more relaxed) which could (should) be used in the design of indieweb reader user interfaces, as it provides opportunities to outdo silo UX. I ( Shane Becker) have "plans" to build a personal reader, as a separate project, called Dark Matter Reader. I made a static prototype in 2010-08 (with static snapshots of real data from then). Given a URL, a reader needs to be able to reliably find the list of entries on the page. Given someone's home page, they may link to one or more additional feeds of posts other than what's visible on the home page. In 2015, at the XOXO festival, Aaron Parecki created a private stream of tweets from attendees who mentioned "xoxo," and those tweets appeared in the conference's Slack channel. This was hugely popular at the conference since the hashtag on Twitter was being spammed, making it impossible to read actual content about the conference on Twitter itself. I enjoy the integrated experience of an indie reader, but am missing comments and likes from others. This is especially noticeable when I want to comment on something and then realize someone may have made the same comment, a better comment, or a comment that makes my comment seem silly. A "(n) comments" indicator would be a nice alternative/addition. How to get timely updates? Silo feeds proxied through granary: how to fetch proxy permalinks and not the real permalinks? How should a reader display a post -- should it try to include the whole thing, or just an excerpt or summary? Woodwind includes an optional title ("name") followed by the "content" or "summary" if content is not provided. In general Woodwind tries to show the full content of a post (which can be overwhelming), but because it only fetches the feed page, and not the individual permalinks, it only has access to the infomation in the feed. On h-entry posts (as opposed to h-event), if there is a "name" but no "content" or "summary", the name is displayed as if it were content. In my experience, these posts tend to be note-length posts marked up with only p-name. Considering that a user's interest is likely not limited to content published on Indieweb-enabled sites, an important feature of a reader app could also be the ability to subscribe other sources, such as RSS feeds or even silo feeds (by means of an API, if available). As of December 2017 Sebastian Greger is investigating an approach where incoming links from Indieweb feeds, RSS feeds and links posted by Twitter contacts merge into one reader UI - from where these can then be opened, bookmarked, published etc. Tantek Çelik: I'd like to figure out an incremental development path from including integrated reply-contexts in posts on my site to ... an integrated reader on my site. My sense is that there are useful steps along the way, each of which is both not too hard to implement, and provides actual user benefit when built. I'm not saying there shouldn't be separate / standalone reader UIs like Woodwind and Monocle, rather that that represents existing (pre-social-media) models / apps, and that a compelling UX (as compared to social media) for generations 2-4 will require integrated /reader UX. Documenting emergent incremental steps in IndieMark#aggregation - based on what "reader-like" building blocks people are already building, deploying, using integrated on their own websites. I'm assuming for now that I'm missing key pieces of or underestimating the scope of this challenge, and in particular missing some key difficult building blocks required by an integrated reader. I hope that documenting my thinking and coding as I go will both reveal some of these, and perhaps more importantly, help the community as a whole figure out what some of these missing building blocks may be. Whoever is working on the indie reader problem, please consider the problem of social media distraction (which seems to come more from the reading side than the writing side). See related: silo-quits. Likely as an attempt to compensate for #overload as noted above, users tend to limit the number of sources they follow, thus resulting in another challenge - the loss of signal, AKA "missing good stuff". It is possible that there are some approaches for mitigating overload (e.g. perhaps categorizing notes with non-self-source links as comments on those links, and aggregating them by link destination) that could help bubble up "good stuff" from a larger set of people you follow. It becomes more and more time consuming to maintain a large list of subscriptions in traditional feed readers. It isn't uncommon to see feed URLs go dark, change location or just stop working for whatever reason. It would be advantageous for the next crop of readers to provide tools to help automate this sort of maintenance. It would also be great to find ways for feeds to state "This will never be updated again" and "This feed will be moving to this new location". Status.net - allows you to subscribe to any PuSH-enabled feed on the web and view it on your home page. Many social content hosting silos have integrated reader like features, but only for "feeds" of accounts on the particular silo. 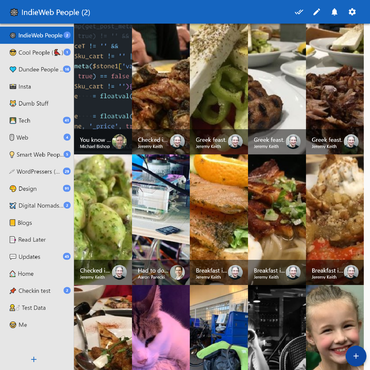 Facebook - logged in home page has a "news feed" that essentially provides feed reader like functionality of the activities (including posts) of friends of the logged in account. search: Social Search for some brainstorming on this.